Bedrock Geology of Ontario, Southern Sheet, Map 2544; Cost: $4.40 + PST/GST + $2.76 shipping: MMIC, Ministry of Northern Development and Mines, 900 Bay St, Room M2-17 Macdonald Block, Toronto, Ontario, M7A 1C3. Telephone: 1-800-665-4480; Pay to Treasurer of Ontario. Within North America the Grenville Province extends from the Labrador coast of Canada to as far to the southwest as Mexico, and perhaps into Australia and Antarctica. and 3) an 'Allochthonous monocyclic' belt formed of rocks largely of Mesoproterozoic age. Each belt is further subdivided into lithotectonic zones on the basis of the tectono-magmatic history of the rocks present in the zone. Other than the youngest intrusive granites, all rocks within the Grenville Province were highly deformed and metamorphosed between 1.2 and approximately 1 billion years, and common rock types include quartzofeldspathic gneiss, commonly garnet-bearing, marble and calc-silicate, quartzite, pelite, meta-volcanic rocks, breccias, metadiabase, anorthosite, gabbro, amphibolite, granulite, eclogite, tonalite, granite, syenite, and migmatite. The least metamorphosed supracrustal rocks are found in the Elzevier terrane, the supposed composite arc allochthon. It has been argued on the basis of lead isotope data (DeWolf and Mezger, 1994) that in Ontario Archean crust, or Lower Proterozoic rock derived from the Archean, underlies the northern Grenville Province at least as far to the south as Parry Sound. 1) a parautochthonous unit composed of orthogneiss, quartzofeldspathic and quartzose paragneiss, kyanite-garnet schists, and amphibolites, intruded by the 2.45 Ga River Valley anorthosite-gabbro suite, 1.75 Ga gabbros, 1.75 - 1.605 Ga granitoids, 1.47-1.38 Ga granitoids, 1.268 -1.222 Ga anorthosite (St. Charles, Mercer), 1.244 Ga granitoid bodies, and 1.238 Ga Sudbury diabase. The gneissses are Archean in age whereas the metasediments and amphibolites may be Paleoproterozoic. Locally, orthoquartzitic metasediments (e.g. the Alban orthoquartzites) overlie quartzofeldspathic gneisses. The quartzites contain detrital zircons of both Archean (2.7 Ga) and Penokean (1.885 Ga) age, and have Sm/Nd isotopic characteristics intermediate between those of Archean rocks to the north and some younger component. The quartzites may have been deposited in a Mesoproterozoic age sedimentary basin located between the Southern Province and a southerly Penokean or younger arc. Similar quartzites are found along the Ontario - Quebec border northeast of North Bay (D168). The younger source must have been older than 1.47 Ga since the sediments are intruded by granites of this age. The southern part of the parautochthon is occupied by Paleoproterozoic metasedimentary gneisses (Barilia) with ca. 1.9 Ga Nd/Nd model ages. The are thought to represent a juvenile off-shore 1.86 Ga Penokean arc, possibly an eastern lateral equivalent of the Penokean arc in Wisconsin to the west of the Great Lakes. As in the case of the rocks further north, the gneisses are intruded by 1.75 and 1.45 Ga granitoids. Grenvillian granites with ages of 1.25 Ga are well developed in the region of Lake Nipissing. The youngest rocks in the parautochthon are garnet granulite and amphibolite dike segments and boudins representing the remains of Sudbury diabase dikes. They are found in all units as far south as the boundary of the parautochthon with the lowermost unit of the overlying allochthonous thrust stack. 2) The lowermost unit of the allochthonous thrust stack, the Algonquin terrane, is composed of high P-T gneisses (containing eclogites and garnet granulites) which exhibit younger much less consistent Nd model ages (1.87-1.56 Ga). Two groups of orthgneiss have been identified, one group with ages ranging from 1.715-1.610 Ga, an age range equivalent to the Yavapai/Mojavie accretion event and the Mazatzal orogeny of the central and southeastern USA, and the other with ages 1.47-1.375 Ga. Some eclogite bodies also have protolith ages of about 1.47 - 1.4 Ga, and metamorphic ages (secondary zircon growth) of 1.09 The Algonquin terrane is also distinguished by the presence of bodies of coronitic olivine metagabbro with protolith ages of 1.16 Ga.
3) The thrust slice above the Algonquin terrane includes the Shawanaga domain outcropping north of the Parry Sound thrust slice, and the Ahmic, upper Go Home and upper Rosseau windows south of the Parry Sound slice. Protolith ages of granitoids are entirely Mesoproterozoic (1.465-1.300 Ga), and Nd model ages are 1.64-1.46 Ga. Eclogites record the oldest metamorphic ages (1.12 Ga) but peak metamorphism could be as young as 1.08 Ga. If the Algonquin and Shawanaga slices are separate terranes, they were stitched by the 1.16 Ga metagabbro suite. 4) The Parry Sound thrust slice is composed of highly deformed and metamorphosed mafic meta- igneous rocks bordered to the north by anorthosite, anorthositic gabbro, and amphibolite with an age of c. 1.4 Ga. The slice is thought to be exotic and far travelled from an oceanic domain to the southeast. 5) The Muskoka slice is composed of 1.455 -1.395 Ga rocks with Nd model ages of 1.62-1.41 Ga. Metamorphism took place at 1.095-1.025 Ga but may also predate 1.1 Ga. The 1.16 Ga metagabbros are represented in the Muskoka slice but eclogite bodies either do not exist or have been converted to amphibolite. Those granitic rocks with an age of c. 1.45 Ga are common throughout the Grenville as far north as the Southern Province-Grenville boundary zone, and are considered by some to represent a post-orogenic suite of intrusions formed by the melting of older crust. Rocks of the 'Allochthonous monocyclic thrust belt includes three slices: the Central Metasedimentary belt, the Frontenac belt, and the Adirondack-Morin belt. 6) Grenville supergroup carbonates (marbles) and volcanic rocks (amphibolites) of the Central Metasedimentary belt. Anorthosite and associated rocks (Morin) intrusive into this terrain have relatively young Grenville ages (c. 1.0 Ga). The volcanic rocks appear to be derived from the mantle and either represent a Neoproterozoic rift or arc marginal basin thrust from the southeast. Within the eastern Quebec section of the Grenville Province rocks with model ages of c. 1.5 Ga constitute an oceanic arc terrane referred to as 'Quebecia' by Dickin (2000). Within Quebecia the 1.41-1.39 Ga La Bostonnais igneous complex represents a younger ensialic arc formed after amalgamation of Quebecia with more internal arc terranes. 7) Frontenac supergroup carbonates and quartzites with detrital zircons as young as 1.3 Ga and as old as 1.415, 1.6-1.795, 1.745-2.065, 2.12-2.58, 3.185. The Frontenac sediments must therefore be younger than 1.3 Ga. They are intruded by 1.17 Ga granites with 1.34 - 1.48 Ga model ages, and quartzofeldspathic gneisses have 1.56 - 2.045 Ga model ages, implying the existence beneath the Frontenac of source material (either basement or derived sediment) older than 2.05 and younger than 1.34. 8) The Adirondack-Morin belt is composed of 1.35 Ga gneisses, 1.17 and 1.08 plutonic suites, and 1.15 anorthosite bodies. Assembly of the Grenville as a collision zone may have taken place in several stages. Initially with the obduction of the Elzevir and related terranes at 1190-1180 Ma, followed by thrusting of the Frontenac over the Elzevir, and of the Parry Sound terrane over the Central Gneiss belt, at 1161 Ma, and finally with the emplacment of all southerly terranes over the Britt terrane at 1080 - 1050. The Huronian was tightly folded into a set of east-west trending doubly plunging folds prior to the injection of sheets and dikes of Nipissing diabase at 2.2 Ga. It was then brecciated and injected by fluidized breccia material as a result of the 'Sudbury event' before being subject to two further phases of deformation, the first of which involved penetrative pure shear and the second non-penetrative simple shear. 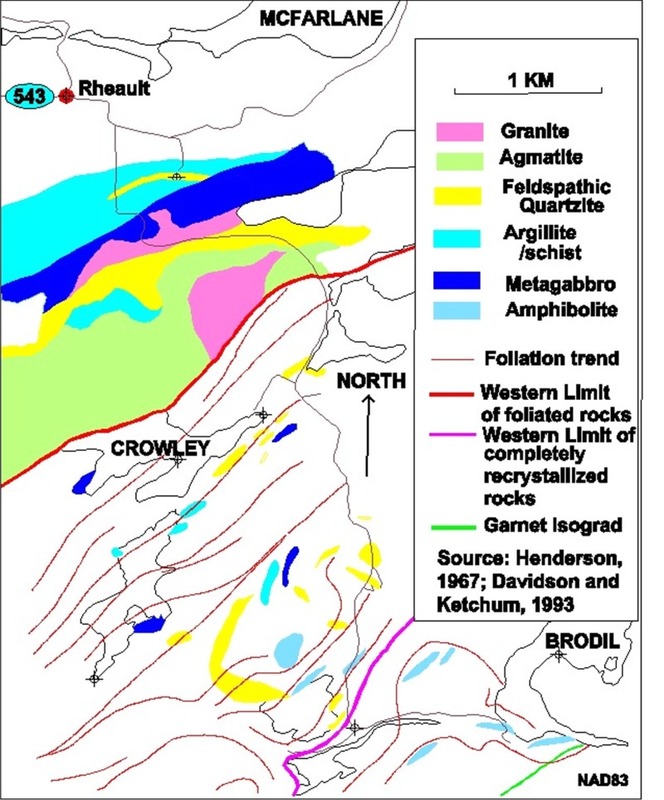 On the basis of the common presence of shatter cones in Huronian quartzites south of Sudbury and the distribution of the enigmatic 'Sudbury breccia' and Onaping 'fall-back' rocks, it is thought that the Sudbury basin represents the remains of a Paleoproterozic meteorite impact intruded by a 'circular' body of mafic to felsic material, the Sudbury Irruptive, generated by impact partial melting of Archean and Huronian rocks. The fall-back rocks are overlain by a folded and cleaved succession of mudstones and turbidites, the Whitewater Group. The irruptive is 1.85 Ga old and is deformed and metamorphosed along its southern rim. It is cut by quartz-diabase or 'trap' dykes that are deformed and metamorphosed to amphibolite. Pleochroic amphibole mantles relict cores of pyroxene and amphibole. The 'trap' dikes have chilled margins 'suggesting intrusion into cool Sudbury Irruptive complex rocks'. In contrast, diabase of the Sudbury swarm crossing the Sudbury basin are unmetamorphosed and undeformed. At about 1.75 Ga, granitoid bodies (Killarney granites) were intruded after the second deformation event and either prior to or during the third deformation event in both the Cutler and ‘Grenville Front’ areas. The curvature of the Huronian stratigraphy and east-west structural trends (MacGregor Bay fold structure) into parallelism with the the north-east trending ‘Grenville Front’ may be related to this event, since Huronian pelitic rocks are folded by north-west trending folds at the front prior to their conversion to andalusite-cordierite-bearing schists by the granites. To the northeast the relative distribution of Huronian rocks within the granites suggests that a synclinal axis runs through the granites such that to the south-east of the granites the Huronian sucession would face north-west. The folded gneisses to the south-east of the granite belt does include belts of kyanite-garnet-biotite schist perhaps representing metamorphosed Huronian aluminous metasediment (McKim formation) intercalated with Archean basement gneisses. Some quartzite units within this belt are almost certainly Huronian equivalents because they contain detrital zircons of Archean age as well as zircon needles, evidently of metamorphic origin, with an age of 1.7 Ga. Metagabbro bodies injected into these rocks may belong to the Nipissing diabase suite. The gneisses also contain deformed anorthosite-gabbro bodies of early Proterozoic age, and a gabbro-granophyre body dated at 1.75 Ga. The Killarney granites were subsequently injected by the younger 1.4 Ga Bell Lake granite, which was itself non-pentratively deformed along its southern margin prior to injection of the Sudbury diabase suite of dikes. Where the 1.238 Ga olivine-bearing diabases (often containing large xenocrysts of plagioclase) of the Sudbury swarm cut Huronian rocks of the Southern Province, the diabases are straight and only locally faulted. However, when traced into the Grenville Province, the diabase rocks become irregular in form, are cut by non-penetrative ‘brittle’ mylonite zones, and contain metamorphic spinel (cloudy plagioclase) and garnet. Further into the Grenville Province the diabases undergo penetrative ductile deformation and form isolated boudins of pyroxene-garnet or garnet-amphibole rock. Within shear pods the igneous texture of the diabases are easily recognisable in spite of the replacement of plagioclase by garnet. The penetrative deformation recognisable in the diabases represents the Grenville orogeny. Lambert-David-D; Frick-Louise-R; Foster-Jeffrey-G; Li-Chusi; Naldrett-Anthony-J., 2000. Re-Os isotope systematics of the Voisey's Bay Ni-Cu-Co magmatic sulfide system, Labrador, Canada; II, Implications for parental magma chemistry, ore genesis, and metal redistribution. In: A special issue on Voisey's Bay Ni-Cu-Co deposit. Naldrett-Anthony-J (editor); Li-Chusi (editor), Economic Geology and the Bulletin of the Society of Economic Geologists. 95; 4, p 867-888. AB: Re-Os isotope data have been obtained for sulfide samples from five environments within the 1333 Ma Voisey's Bay intrusion (Ovoid, Eastern Deeps, Discovery Hill zone, Reid Brook zone, and Basal Breccia sequence) and the 1313 Ma Mushuau intrusion (Sarah prospect), as well as unmineralized gabbroic and troctolitic intrusions, Archean Nain orthogneiss, and Proterozoic Tasiuyak paragneiss, in order to assess the role of crustal contamination in the genesis of this large Cu-Ni-Co sulfide deposit. Massive sulfide samples have high Re concentrations (148-288 ppb) compared to their Os concentrations (4.8-28 ppb), yielding high Re/Os ratios (2.9-38) that are similar to those for massive sulfides from Sudbury and the Duluth Complex. Whole-rock Re-Os isotope data exhibit a large spread in 187Re/188 Os (14-157) but do not define a precise isochron, most likely the result of R factor variations within this dynamic ore system (R factor = effective mass of silicate magma with which a given mass of sulfide magma has equilibrated). Large whole-rock sulfide samples from the Ovoid yield an imprecise 1320 Ma isochron age that is consistent with baddeleyite U-Pb ages from the magmatic system. However, data for sulfide (chalcopyrite, pyrrhotite, pentlandite) and oxide (magnetite, ilmenite) mineral separates from the Ovoid and a troctolite from the Eastern Deeps yield and isochron with an age of 1004+/-20 Ma, consistent with Re-Os TCHUR model ages for some low Os troctolites and olivine gabbros from the magmatic system. These data suggest that the Re-Os system may have been reset at the mineral scale and metals redistributed during a heating-hydrothermal alteration event which coincided temporally with the Grenville orogeny. The high initial gammaOs values (200-1,100 = percent deviation in calculated initial 187Os/ 188Os from mantle of the same age) for sulfide-rich samples from the Voisey's Bay intrusion document significant magma interactions with older Nain-Churchill province crust as there are no known mantle reservoirs with these extreme geochemical characteristics. Re-Os isotope modeling suggests that a reasonable fit to the sulfide data may be obtained via contamination of basaltic magma similar to fine-grained feeder zone olivine gabbros and troctolites with sulfidic-graphitic Proterozoic Tasiuyak paragneiss (gammaOs = 1,900), followed by an R factor process (300->5,000) that improved the tenor (metal concentration in 100% sulfide) of the sulfide liquid during transport in the active Voisey's Bay magma conduit or after deposition in the active-replenished Eastern Deeps magma chamber. However, R factors of this magnitude (>5,000) are not supported by Cu, Ni, and PGE data for the mineralization. Thus, chalcophile element-depleted feeder olivine gabbros and troctolites from the Voisey's Bay intrusion may represent frozen magmas that were the end product of sulfide saturation and segregation during the early stages of mineralization. More internally consistent R factors (50-500) are obtained if the immiscible sulfide magma interacted with a second, chalcophile element-undepleted (>150 ppt Os) magma. Compelling evidence for the presence of more fertile magmas in the Voisey's Bay system comes from the geochemical and Re-Os isotope data for unmineralized melatroctolite inclusions within the Basal Breccia sequence. These inclusions contain olivine with high MgO and Ni concentrations and low La/Sm and Th/Nb ratios, a high Os concentration, and an enriched (but near-chondritic) initial Os isotope composition (gammaOs = 9), geochemical features that are consistent with high MgO basaltic or picritic, plume-type magmas. Berman, R.G. , 1991 Thermobarometry using multiequilibrium calculations: a new technique, with petrological applications: Canadian Mineralogist, 29, , 833-855. The Canadian Mineralogist. 38, Part 2; Pages 277-285. Bickford, M.E. Van Schmus, W.R., and Zietz, I., 1986 Proterozoic history of the midcontinent region of North America: Geology, 14, 6, 492-496. Busch, J.P. Mezger, K., van der Pluijm, B. A., 1997 Suturing and extensional reactivation in the Grenville orogen, Canada: Geology, 25, 6, 507-510. Corfu, F. and Easton, R.M., 1995 U-Pb geochronology of the Mazinaw terrane, an imbricate segment of the Central Metasedimentary Belt, Grenville Province, Ontario: CJES, 32, 7, 959-976. Easton, R.M. Buckley, S.G., Lobabok, E., and James, R.S., 1999 Grenville - Southern province relationships in Street Township, District of Sudbury: In Report of Field Work and Other Activities . Ontario Geol. Surv. Misc. Paper 166, , 2, 66-69. 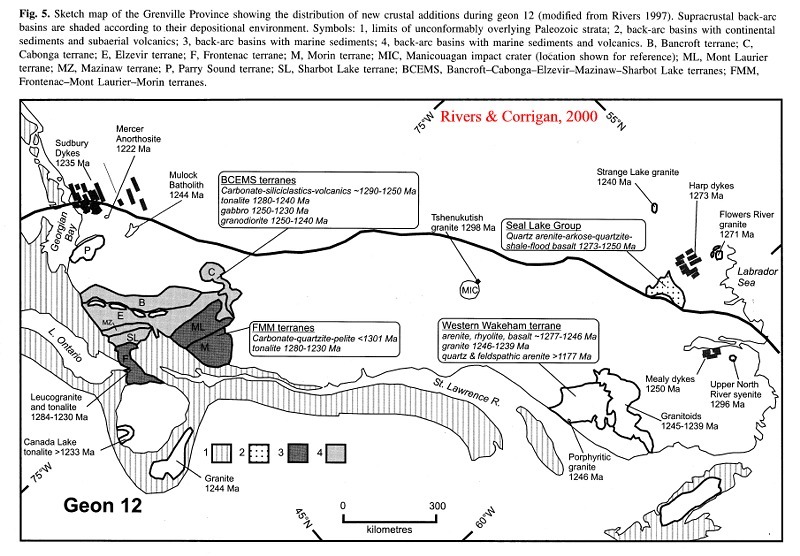 Corfu, F. and Easton, R.M., 1997 Sharbot Lake terrane and its relationship to Frontenac terrane, Central Metasedimentary Belt, Grenville Province: new insights from U-Pb geochronology: CJES, 34, 9, 1239-1257. Corfu, F. and Easton, R.M., 1998 Extension of the Huronian magmatic suite inside the Grenville Province: new zircon U-Pb evidence from the Grenville Front tectonic zone in Street Township, Sudbury region, Ontario: Proceedings of the 44th annual Institute of lake Superior Geology, 44, 2, 59-60. 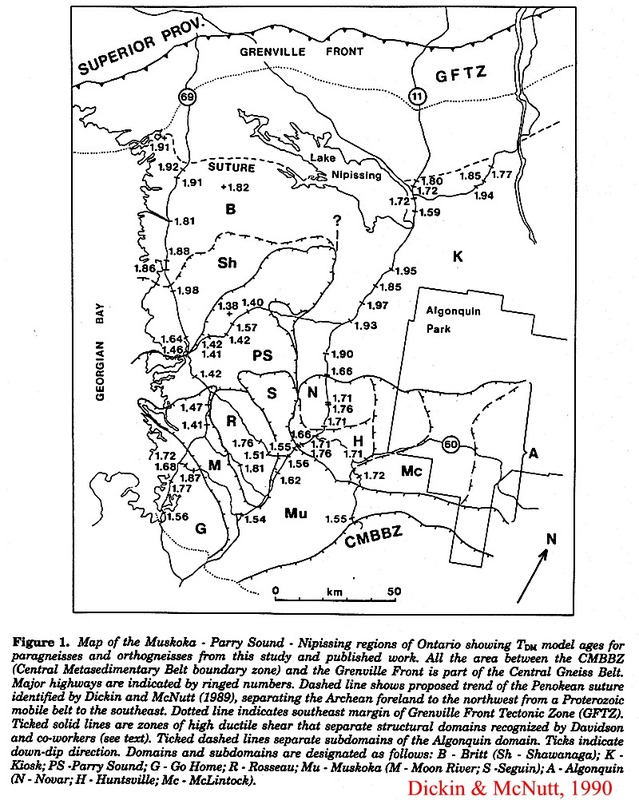 Corrigan, D. , 1990 Geology and U-Pb geochronology of the Key Harbour area, Britt domain, southwest Grenville Province: M.Sc. thesis, Dalhousie University, Halifax, N.S., 168p. Culshaw, N.G. 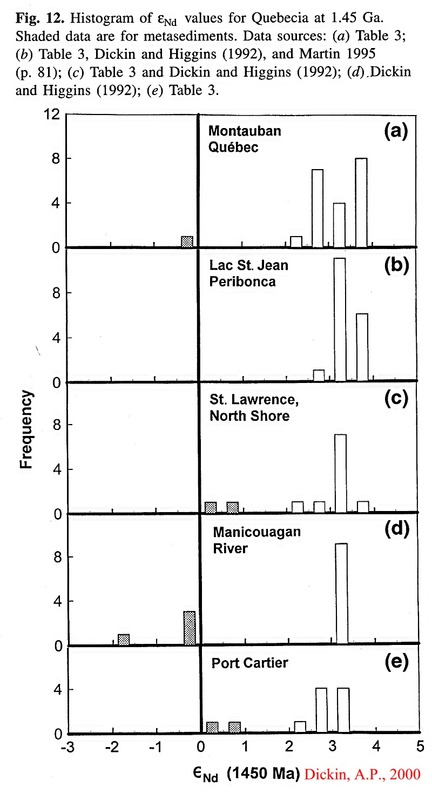 Corrigan, D., Drage, J., and Wallace, P., 1988 Georgian bay geological synthesis: Key Harbour to Dillon, Grenville Province of Ontario: Current Research, Part C, Geol. Surv. of Canada Paper 88-1C, 129-133. Culshaw, N.G. et al., 1994 Deep crustal ductile extension following thrusting in the south-western Grenville Province, Ontario: CJES, 31, 1, 160-175. Cureton, J.S. van der Pluijm, and Essene, E.J., 1997 Nature of the Elzevir - Mazinaw domain boundary, Grenville Orogen, Ontario: CJES, 3, 976-991. Davidson, A. and Carmichael, D.M. discuss Hildebrand, R.S. and Easton, R.M. reply, 1997 An 1161 suture in the Frontenac terrane, Ontario segment of the Grenville orogen: Geology, 25, 1, 88-89. Synopsis - maps of Wynne Edwards show that the vast majority of pre-1160 Ma plutons do not contact the marbles, and there are no unambiguous cross cutting relationships. Titanite (Mezger, 1993) in marble ranges from 1157-1178, 4 greater than 1169, all titanites are from the melange and older titanites may be from the upper plate. Melange also met zircon at 1168+3 and titanites at 1159 and 1153 (Corfu, 1995). Dickin, A.P. 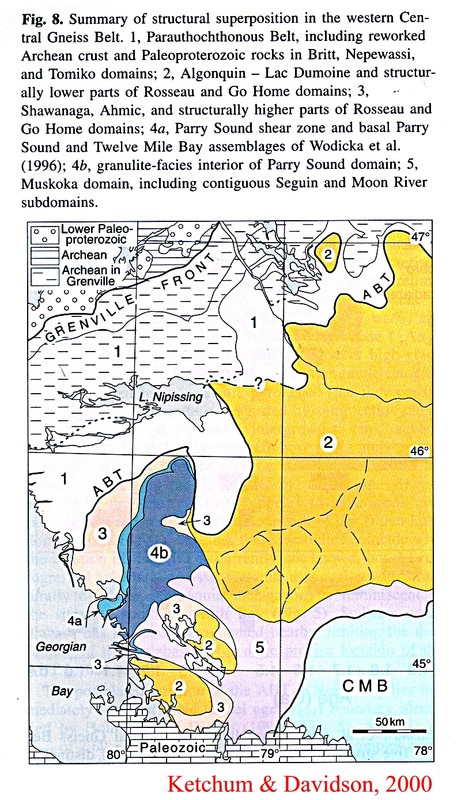 and McNutt, R.H., 1989 Nd model age mapping of the southeast margin of the Archean foreland in the Grenville province of Ontario: Geology, 17, 4, 299-302. Dickin, A.P. McNutt, R.H., and Clifford, P.M., 1990 A neodymium isotope study of plutons near the Grenville Front in Ontario, Canada: Chemical Geology, 83, 315-324. Dickin, A.P. 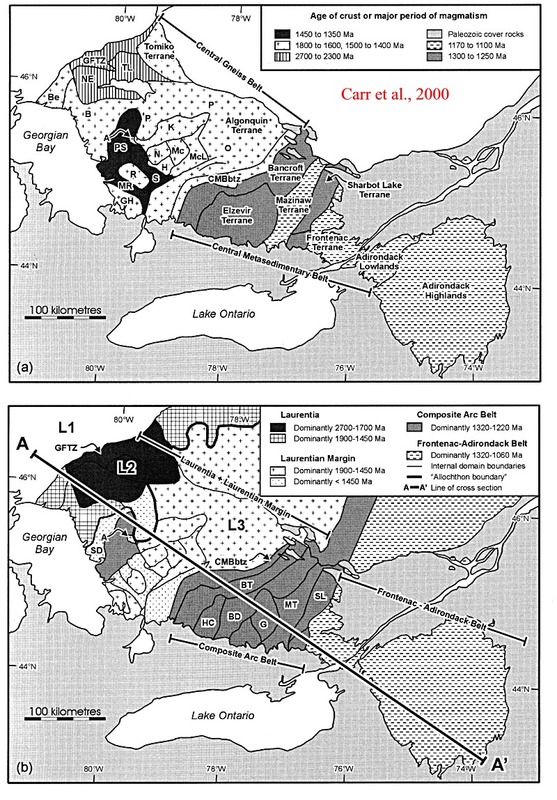 and McNutt, R.H., 1990 Nd Model-age mapping of Grenville lithotectonic domains: Mid-Proterozoic Crustal Evolution in Ontario: in Gower, C.F., Rivers, C.F., and Ryan, B., eds., Mid- Proterozoic Laurentia - Baltica: Geol. Assoc. Canada, Special Paper 38, 79-94. Dickin, A.P. and Higgins, M.D., 1992 Sm/Nd evidence for a major 1.5 Ga crust-forming event in the central Grenville Province: Geology, 20, 2, 137-140. Dickin, A.P. discuss DeWolf, C.P. and Mezger, K., reply, 1995 Comment on "Lead isotope analyses of leached feldspars: constaints on the early crustal history of the Grenville Orogen": Geochimica Cosmochimica Acta, 59, 24, 5233-5234, 5235-5237. Easton, R.M. , 1992 1992 Friends of the Grenville Workshop: Geos. Can., 19, 1, 38-40. Easton, R.M. 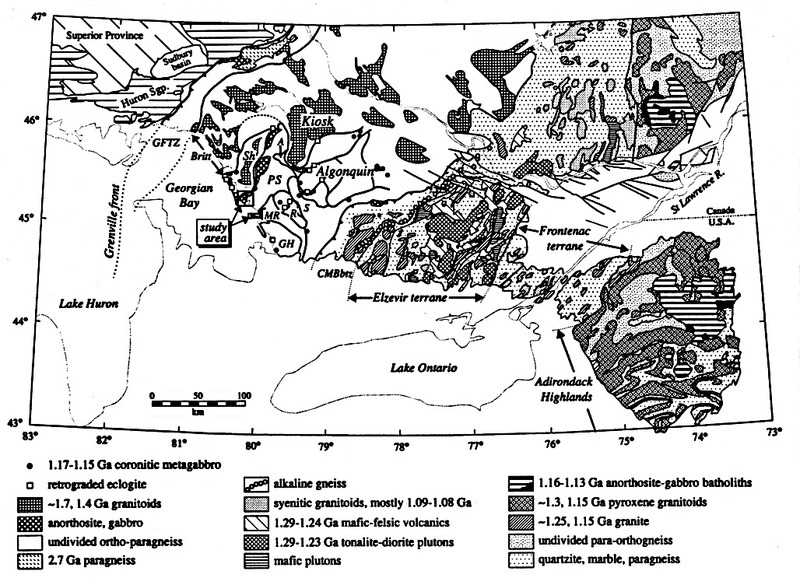 , 1995 Regional geochemical variation in Grenvillian carbonate rocks: implications for mineral exploration: Ontario Geological Survey Miscellaneous Paper 164, Summary of field work and other activies, 1995, 6-18. Easton, R.M. , 1996 Project Unit 95-31. Geology of garnetiferous gneisses in Street Township, District of Sudbury: Ontario Geological Survey Miscellaneous Paper 166, Summary of Field Work and Other Activities 1996, , 2, 70-73. Easton, R.M. , 1997 35. Project Unit 88-05. Regional Mapping and Stratigraphic Studies, Grenville Province: Summary of Field Work and other activities, 1989, Ont. Geol. Surv. ; Ont. Geol. Surv. Misc. paper 146, 153-157. Easton, R.M., Davidson, A., and Murphy, E., 1999 Transects across the Grenville Front near Sudbury, Ontario: Geol. Assoc. Canada, Field Trip A2 Guidebook, , 2, 52 pp. Easton, R. and Stott, G.M. discuss Parrish, R.R. 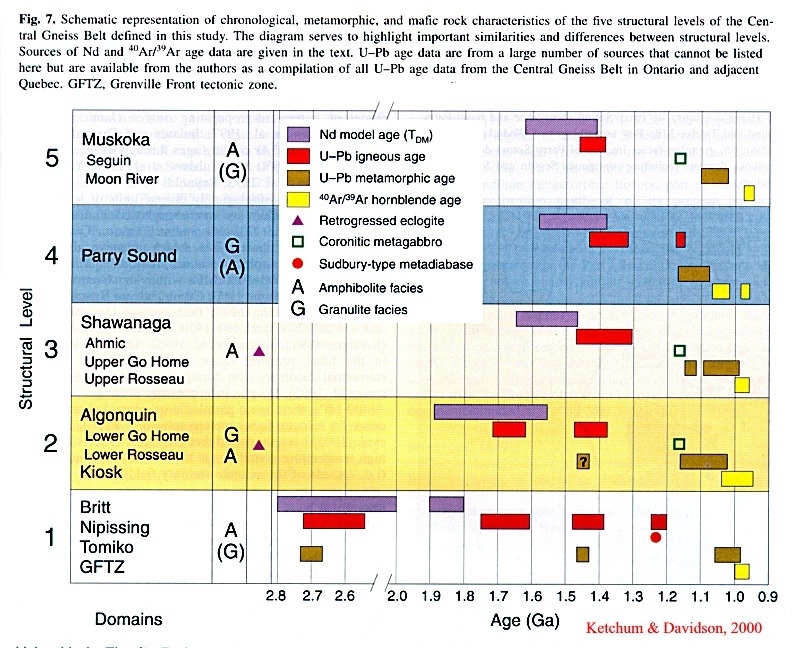 and Sager-Kinsman, E.A., 1993 Geochronology of detrital zircons from the Elzevir and Frontenac terranes, Central Metasedimentary Belt, Grenville Province, Ontario: CJES, 30, 12, 2523-2525. Eaton, D.W. Hynes, A., Indares, A., and Rivers. 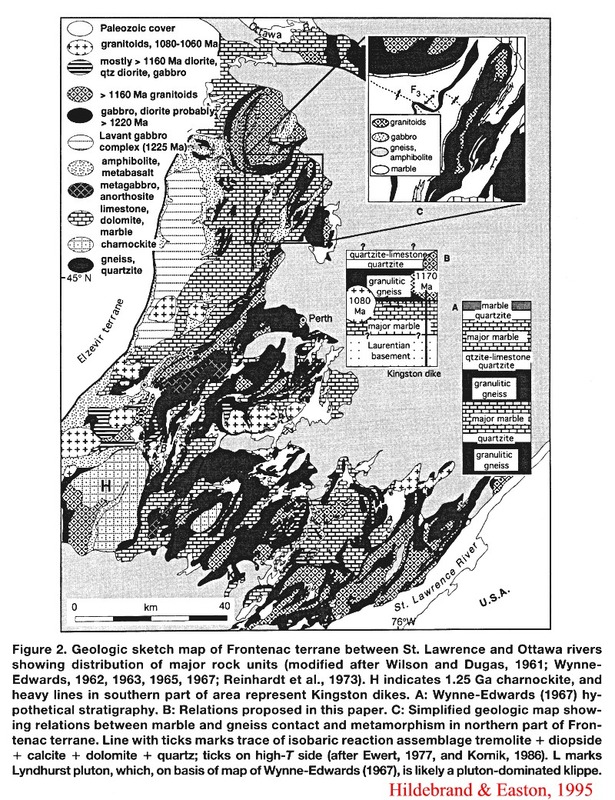 T., 1995 Seismic images of eclogites, crustal-scale extension, and Moho relief in the eastern grenville province, Quebec: Geology, 23, 9, 855-858. Haggart, M.J. Jamieson, R.A., Reynolds, P.H., Krogh, T.E., Beaumont, C., and Culshaw, N.G., 1993 Last gasp of the Grenville Orogeny: thermochronology of the Grenville Front Tectonic zone near Killarney, Ontario: Jour. Geol., 101, 575-589. Hanmer, S. and McEachern, S., 1992 Kinematical and rheological evolution of a crustal-scale ductile thrust zone, Central Metasedimentary Belt, Grenville orogen, Ontario: CJES, 29, 8, 1779-1790. Hanmer-S; Corrigan-David; Pehrsson-S; Nadeau-L 2000. SW Grenville Province, Canada; the case against post-1.4 Ga accretionary tectonics. Tectonophysics. 319; 1, Pages 33-51. 2000. AB: Seven accretionary sutures, formed between 1.16 and 1.03 Ga, have been identified by different authors in the Ontario-Quebec-Adirondack (OQA) segment of the Mesoproterozoic Grenville Orogen in Canada. With one exception, the inferred accretionary terrane boundaries lie within, or at the margins of the Central Metasedimentary Belt (CMB), located between the Central Gneiss Belt and the Adirondack Highlands (Central Granulite Terrane). However, geological, geochronological, and petrological data suggest that the Grenville orogen on both sides of the proposed terrane boundaries (sutures) preserves a common 1.4-1.03Ga tectonomagmatic history, inconsistent with its origin as a post-1.4Ga collage of exotic tectonic blocks. Features which straddle the proposed 1.16-1.03Ga "sutures", from the Central Gneiss Belt, via the Adirondack Highlands, to the Mauricie area, include; (1) Mesoproterozoic continental crust (1.5-1.4 Ga) forming the host and/or basement to younger magmatic and supracrustal suites. 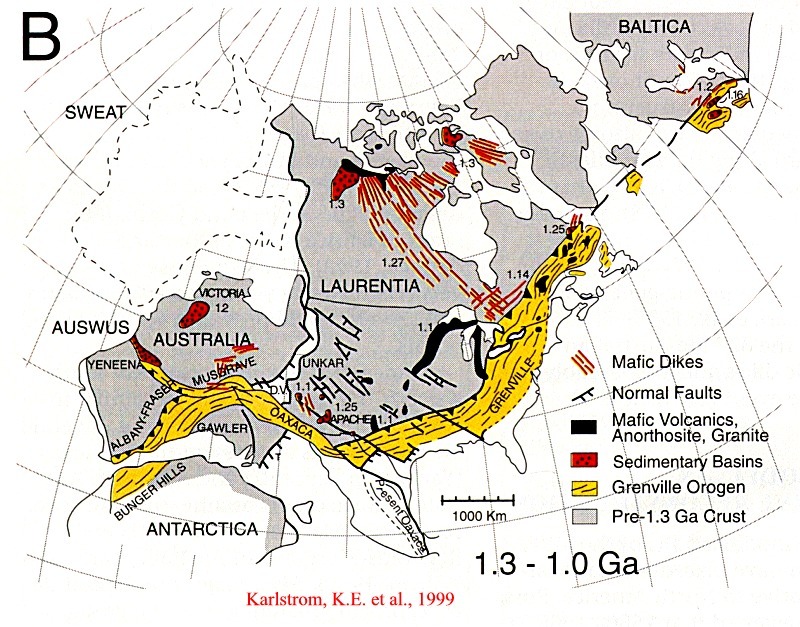 (2) A 1.35-1.3Ga continental arc, remnants of which occur from the CMB boundary zone (CMBBZ) in Ontario to the Appalachians in the United States, built on the 1.5-1.4Ga continental crust. (3) Intrusions of 1.17-1.13 Ga age in the Central Gneiss Belt (mafic suite), and the Adirondack Highlands and their Quebec extension (AMCG suite, i.e. anorthosite massifs and related granitoids). 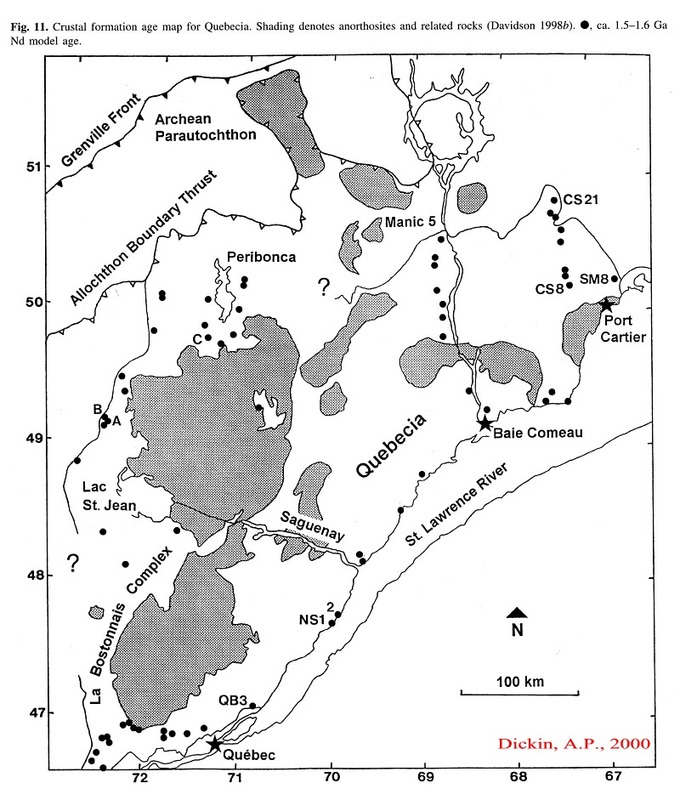 (4) Relics of 1.18-1.14Ga sedimentary basins in the northwestern CMB and the Mauricie area. We propose that an alternative model can adequately account for the observed geology of this part of the Grenville orogen wherein, the rocks of the OQA segment were part of an Andean-type margin between 1.4 and 1.2Ga. At 1.35-1.3Ga, a continental magmatic arc was built upon the southeastern margin of Laurentia represented by the 1.5-1.4Ga Mesoproterozoic continental crust. The arc split at 1.3Ga forming an ensialic back arc basin, relics of which now occur in the northwestern part of the CMB, and the back arc basin was flanked to the southeast by an active 1.28-1.25Ga arc. Collision between the Laurentian margin and another continent (Amazonia?) occurred at 1.2 Ga, resulting in closure of the back arc basin and initiation of thrusting along the CMBBZ. Post-collisional lithospheric shortening led to convective removal of thickened subcontinental lithosphere, upper mantle melting, and extension of the overlying crust, resulting in widespread magmatic activity at 1.17-1.13Ga, including emplacement of the AMCG massifs. 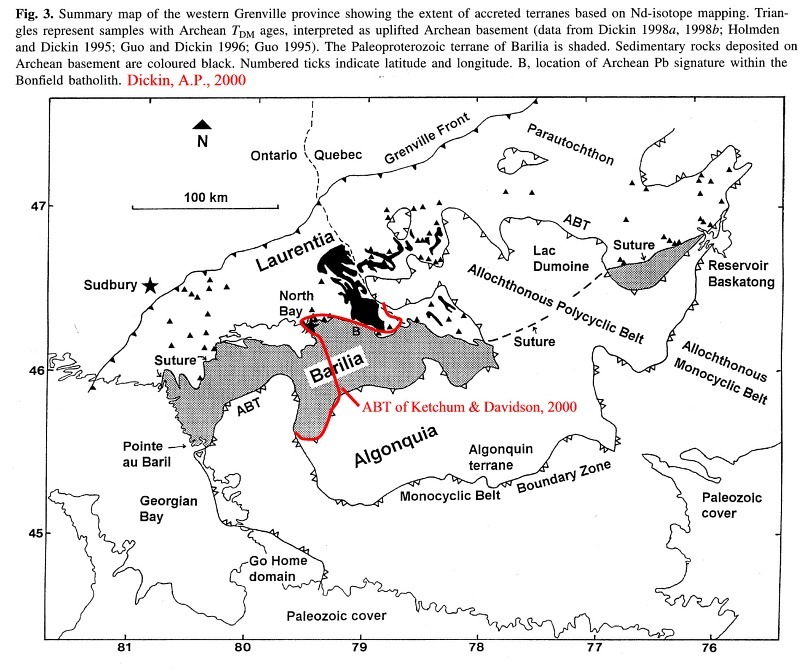 Crustal extension generated sedimentary basins now represented by the St Boniface sediments in the Mauricie area (1.18 to between 1.15 and 1.09Ga), and the penecontemporaneous Flinton Group in the northwestern CMB. Renewed, post-collisional, granulite facies shortening commenced at 1.12 Ga, manifested as nappes in the Central Gneiss Belt, and thrusting in the Mauricie area. Continued post-collisional shortening at 1.08-1.05 Ga was more localised, resulting in reactivation of thrusting in the CMBBZ, and initiation of the kinematically compatible Tawachiche shear zone along the eastern border of the Quebec extension of the Adirondack Highlands. The characteristics of the OQA segment of the Grenville Orogen can all be accounted for in the context of; (1) a 1.4-1.2Ga, southeast facing Andean-type margin to a Laurentian upper plate, associated with northwest dipping subduction; (2) continental collision at 1.2Ga; and (3) subsequent, continued, post-collisional shortening, without invoking accretion of exotic terranes between 1.4 and 1.0Ga. Hildebrand, R.S. and Easton, R.M., 1995 An 1161 Ma suture in the Frontenac terrane, Ontario segment of the Grenville orogen: Geology, 23, 10, 917-920. Province, southern Labrador. Government of Newfoundland and Labrador. Geological Survey.Current Research Report. Pages 169-178. .
AB: Preliminary U-Pb geochronological studies of zircon and titanite collected from samples of gneissic monzodiorite, foliated quartz monzodiorite, and an undeformed monzonite that occur in the southwestern part of the Grenvillian Mealy Mountains terrane (MMT) give igneous emplacement ages of 1659 + or - 5 Ma, 1650 + or - 1 Ma and 1643 + or - 2 Ma, respectively. Despite the significant textural and structural differences between the samples, the isotopic data suggest that all three of these pyroxene-bearing granitoid rocks are components of the Mealy Mountains intrusive suite (MMIS), a mid-Labradorian AMCG suite. In contrast, zircons from a sample of foliated granite from the MMT give a 1514 +/ - 10 Ma age, interpreted to be the time of igneous emplacement. This data is significant because it demonstrates that the southwestern MMT includes Pinwarian intrusions, and that it has been overprinted by Mesoproterozoic, post-1514 Ma, deformation. Lower-intercept ages from the two deformed MMIS rocks and the Pinwarian granite are loosely constrained between 1050 and 940 Ma, suggesting the tectonothermal event overprinting these rocks is Grenvillian. However, the data do not eliminate the possibility that the region has been affected by overprinting Paleoproterozoic and Mesoproterozoic events. The fact that the ca. 1643 Ma monzonite is undeformed and has apparently escaped deformation is consistent with field observations that the state-of-strain in the area, at all scales, is heterogeneous, although there is a general increase in both the degree of recrystallization and tectonic fabric development toward the southern MMT. Ketchum, J.W.F. 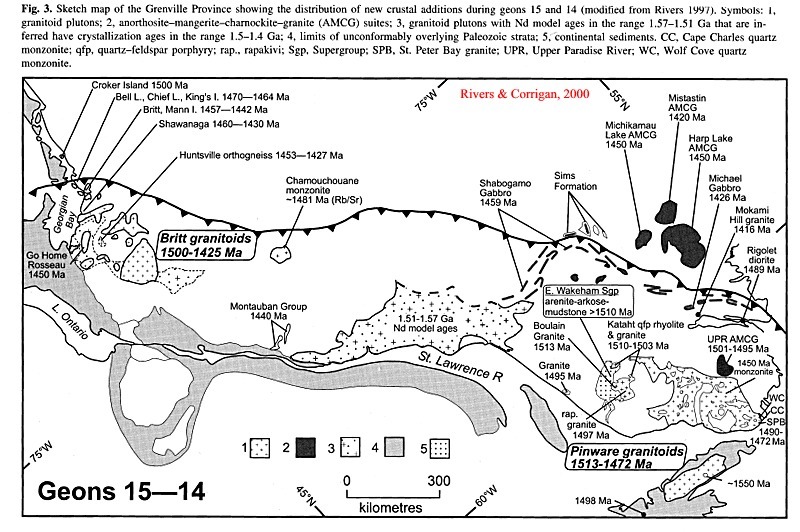 et al., 1993 U-Pb constraints on the late orogenic extensional and thermal history of the Central Britt shear zone, an allochthon - parautochthon boundary in the Central Gneiss Belt, Ontario: Lithoprobe Abitibi - GrenvilleProject Report no. 33, 161-164. Ketchum, J.W.F. et al. 1994. 1.45 Ga granulites in the southwestern Grenville province: geologic setting, P-T conditions, and U-Pb geochronology. Geology, 22, 3, 215-218. Synopsis: Metamorphism and deformation of orthogneiss and supracrustal gneiss before 1684 Ma was followed by further deformation and metamorphism before 1456 Ma (Corrigan, 1990). Granitic to tonalitic plutons were emplaced throughout the Britt domain at ca. 1460-1430 Ma. The low strain area lies within a distinctive structural domain bounded by the Central Britt shear zone and the southeast-dipping Nares Inlet shear zone, which also accomodated southeast directed extension. Outside the the low-strain area in this domain, steep, northeast-striking gneissic foliations and shallowly plunging stretching lineations predominate, in contrast to regional northwest-trending folds and southeast-plunging stretching lineations that generally characterize the Britt domain. Field relations show that northeast-trending fabrics predate development of regional north-west-trending folds and extensional shear zone fabrics, intimating an earlier Grenvillian origin. If extensional shearing and regional folding were coeval (Culshaw et al 1994), decoupling of this crustal block along the boundary shear zones from regional fold deformation may account for the preservation of older structures and mineral assemblages. Resetting of older zircon to 1433 Ma during Grenvillian met. is considered unlikely given the concordance of the analysis. The Nares inlet shear strikes NE-SW, SE dips SE and has SE extension lineation. Klemens, W.P. 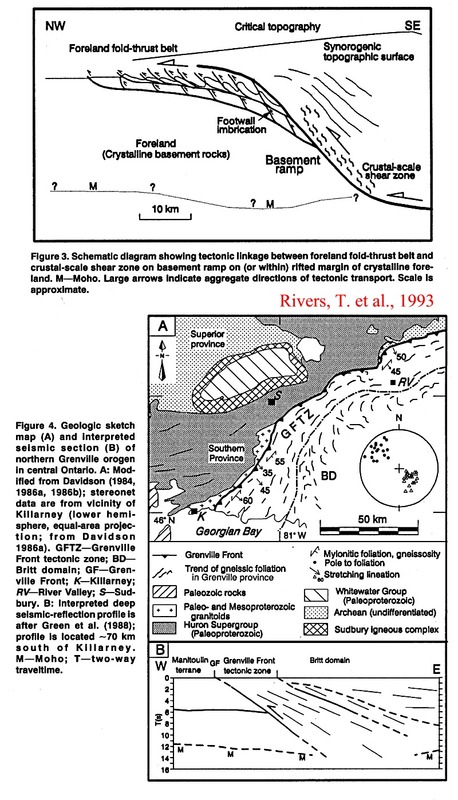 and Schwerdtner, W.M., 1997 Emplacement and deformation of granite pegmatite dykes in a mud-crustal regime of late-orogenic extension, southwest Grenville Province, Ontario, Canada: Geol. Mag., 134, 3, 287-295. Krogh, T.E. 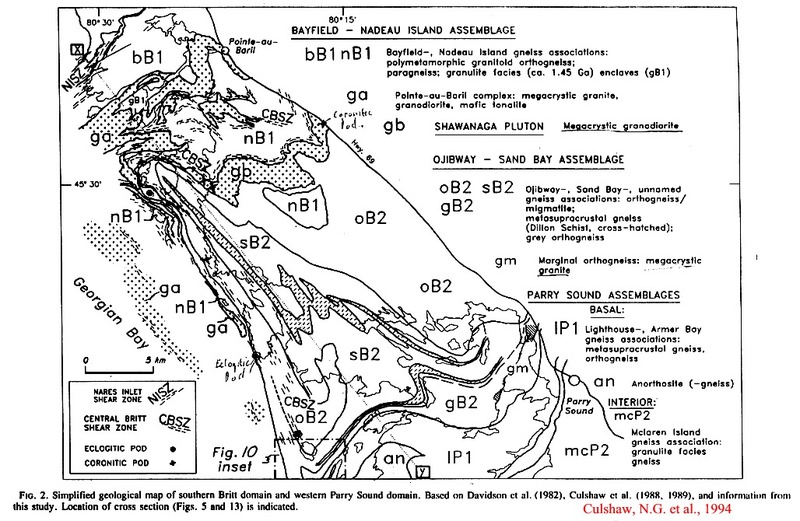 Culshaw, N.G., and Ketchum, J.W.F., 1993 Multiple ages of metamorphism and deformation in the Parry Sound-Pointe au Baril area: Lithoprobe Abitibi - Grenville Project, Report no. 33, 39. 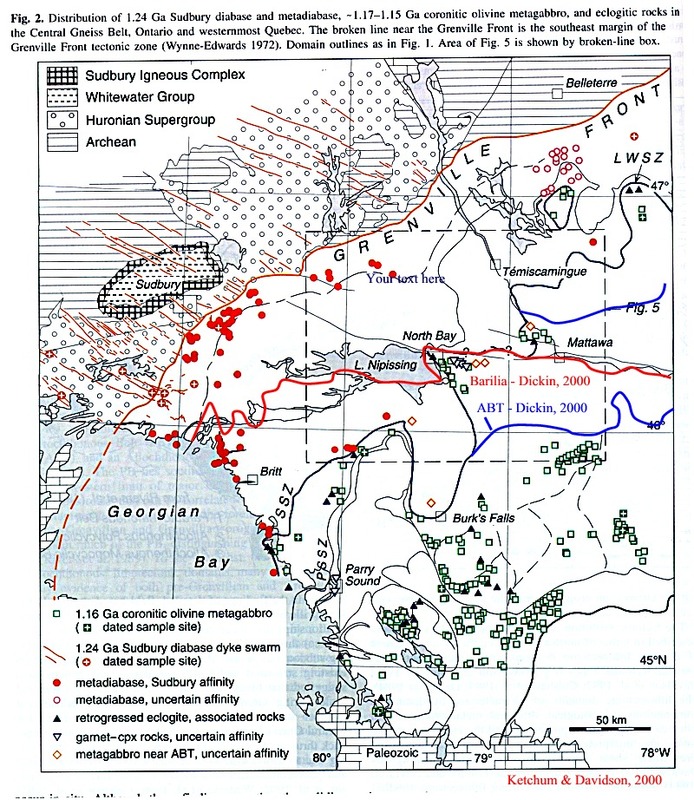 Synopsis - pre or syn met granites near Killarney = 1740; later cataclastically deformed granite = 1550; Strongly lineated Huronian north of the granites are cut by pegmatites with musc. ages of 1450-1470; near Wanapitei local pegmatoids in the font zone have 1150 zircons . North of North Bay highly met. and deformed gneisses 16 km south of the front are cut by undeformed pegs at 2600; South of Val d'Or 60 km south of the front in the granulite met., zircons from undef. local pegs. are 2600 Ma; northwards increase in met. grade due to uplift of progressively deeper Archean crust to the south; near Lac Jeannien, zircon in metagreywacke. with relic granulite minerals. have Archean age. East of the Labrador Trough sphene, monaz., zircon give a mixing line between 1653 and 993; new zircon growth gives 1645 and 1647 = age of pre-Grenville met. ; new zircons in local pegmatoids = 992 = age of most recent metamorphism. Mader, U.K. and Berman, R.G., 1992 Amphibole thermobarometry: a thermodynamic approach: Current Research: Geological Survey of Canada Paper 92-1E, 393-400. 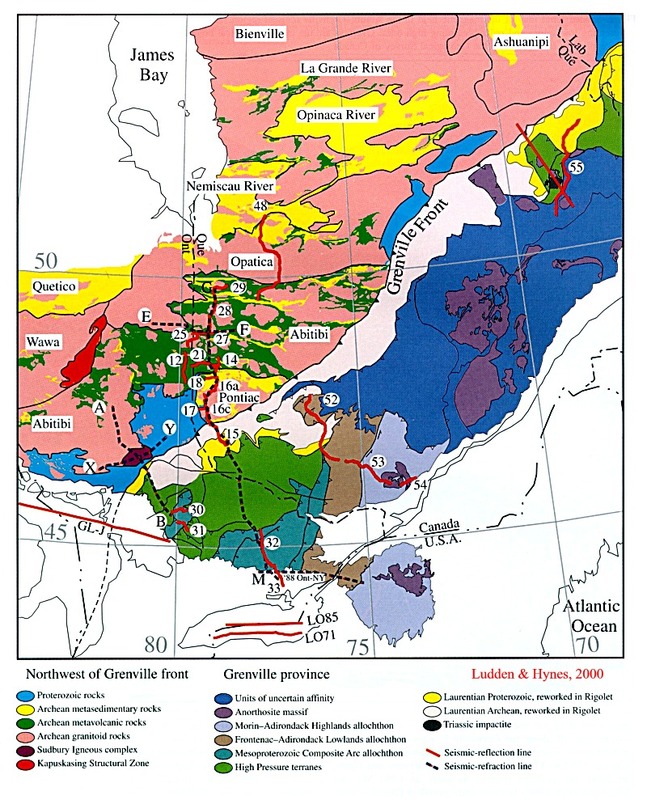 Nadeau, L. , 1990 Tectonic, thermal and magmatic evolution of the Central Geniss Belt, Huntsville region, southwestern Grenville orogen: Ph.D. thesis, Carleton University, Ottawa, 269p. satellite imagery and airborne geophysics.In: Special issue on the applications of RADARSAT-1 data in geology, Singhroy-Vernon-H (prefacer), Canadian Journal of Remote Sensing. 25; 3, Pages 258-267.
dextral; NW-SE sinistral) which were delineated in the radar imagery and confirmed using field kinematic indicators. The RADARSAT imagery provides a view of the extent of this deformation event and corroborates field and petrological studies indicating that by 1.165 Ga, the gneiss complexes were mechanically strong crustal domains and were only locally overprinted by late-stage ductile deformation. Rivers, T. van Gool, J.A.M., and Connelly, J.N., 1993 Contrasting textonic styles in the northern Grenville province: implications for the dynamics of orogenic fronts: Geology, 21, 12, 1127-1130. Sharma-Kamal-N-M; Singhroy-Vernon-H; Madore-Louis; Levesque-Josee; Hebert-Claude; Hinse-Mario 1999. Use of radar images in the identification of major regional structures in the Grenville Province, western Quebec. In: Special issue on the applications of RADARSAT-1 data in geology, Singhroy-Vernon-H (prefacer) Canadian Journal of Remote Sensing. 25; 3, Pages 278-290. Suite. The structural interpretations equally help to constrain the northern limit of the main body of the Central Metasedimentary Belt. The brittle fractures in the southern parts of these areas are related to the Ottawa-Bonnechere and the St. Lawrence Graben Systems. The Radar images have thus been highly useful in outlining most of the structural features previously unknown or only partially known, and not shown on the pre-existing geological maps. Smith, T.E. and Holm, P.E., 1987 The trace element geochemistry of metavolcanic and dykes from the Central Metasedimentary Belt of the Grenville Province, southeastern Ontario, Canada: Pharaoh, T., Beckinsale, R.D., and Rickard,D.T. eds., Geochemistry and Mineralization of Proterozoic volcanic Suites, Blackwell Sci. Pub., 453-470. 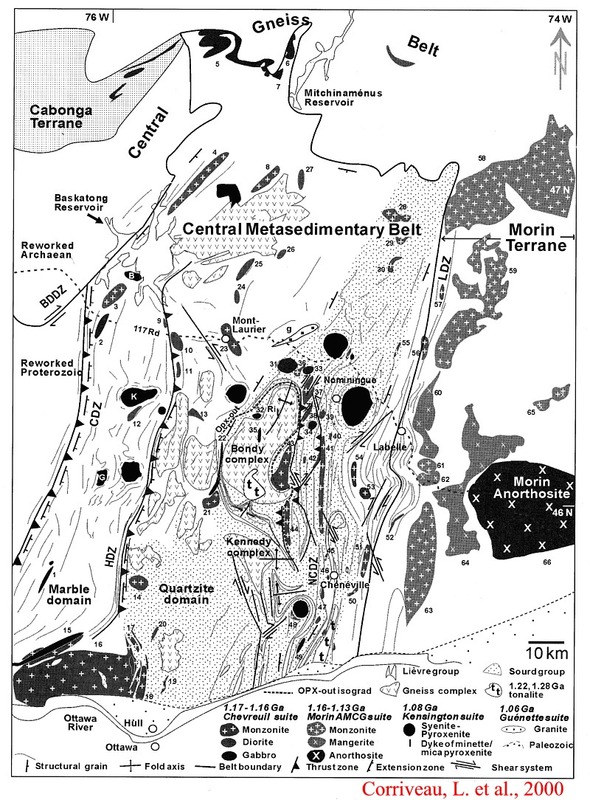 Timmermann, H. Parrish, R.R., Jamieson, R.A. and Culshaw, N.G., 1997 Time of metamorphism beneath the Central Metasedimentary Belt boundary thrust zone, Grenville Orogen, Ontario: accretion at 1080 Ma? : CJES, 34, 1023-1029. Tuccillo, M.E. Mezger, K., Essene, E.J., and van der Pluijm, B.A., 1992 Thermobarometry, geochronology and the interpretation of P-T-t data in the Britt domain, Ontario Grenville orogen, Canada: Jour. Petr., 33, 225-1259. Tucker, R.D. 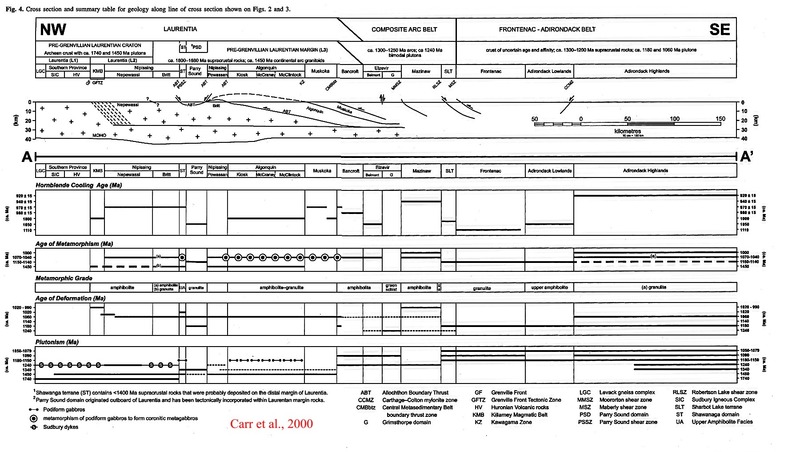 and Gower, C.F A., 1994 U-Pb geochronological framework for the Pinware Terrane, Grenville Province, Southeast Labrador. Jour. Geol., 102, 67-78. Synopsis - granitoids at 1490+5 and 1479+2, 1472+3; enclaves of supracrustal rocks, incl. felsic volc., at 1640+7; granitoids at 1145; zircon in mafic dike at 1000+2; late granites at 960+2 and 959+2; second of two deformation events assumed to be equivalent to zircon in the mafic diabase; D1 deformation is indicated to be Grenville. Van Breemen, O., Davidson, A., Loveridge, W.D., and Sullivan, R.W. 1986. U-Pb zircon geochronology of Grenville tectonites, granulites and igenous precursors, Parry Sound, Ontario. In Moore, J.M. et al., eds., The Grenville Province: Geol. Assoc. Canada Spec. paper 31, p. 191-207. Van Breemen, O. and Davidson, A., 1988 Northeast extension of Proterozoic terranes of mid-continental North America: BGSA, 100, 5, 630-638. Wasteneys, Hardolph; McLelland, James; Lumbers, Sydney, 1999. Precise zircon geochronology in the Adirondack Lowlands and implications for revising plate-tectonic models of the Central Metasedimentary Belt and Adirondack Mountains, Grenville Province, Ontario and New York. Canadian Journal of Earth Sciences, 36; 6, Pages 967-984. AB: New high-precision, single-grain dating of leucogranites from the Adirondack Lowlands, dated previously by multigrain zircon methods at ca. 1416 Ma (Wellesley Island) and ca. 1285-1230 Ma (Hyde School Gneiss), has yielded U-Pb zircon ages of ca. 1172 Ma, identical to that of Rockport granite of the Frontenac terrane. In addition, sensitive high resolution ion microprobe (SHRIMP) zircon dating of the intrusive Antwerp-Rossie suite in the Adirondack Lowlands indicates a maximum emplacement age of ca. 1207 +26/ -11 Ma which fixes a minimum age for deposition of regional metasedimentary rocks that it crosscuts. These results remove apparent chronological discrepancies across the St. Lawrence River, thus expanding the significance of the Rockport granite and Hyde School Gneiss and requiring modification of plate-tectonic models for the Central Metasedimentary Belt and Adirondack Mountains in the interval ca. 1350-1125 Ma.White, D.J. 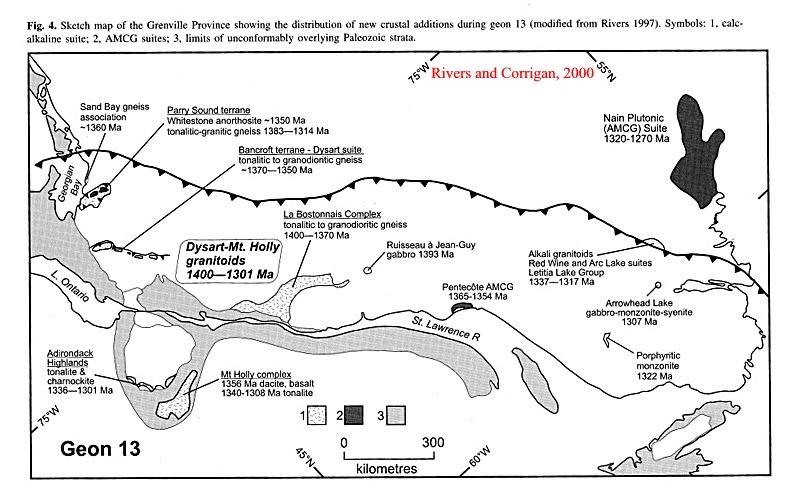 et al., 1994 Seismic images of the Grenville Orogen in Ontario: CJES, 31, 2, 293-307. 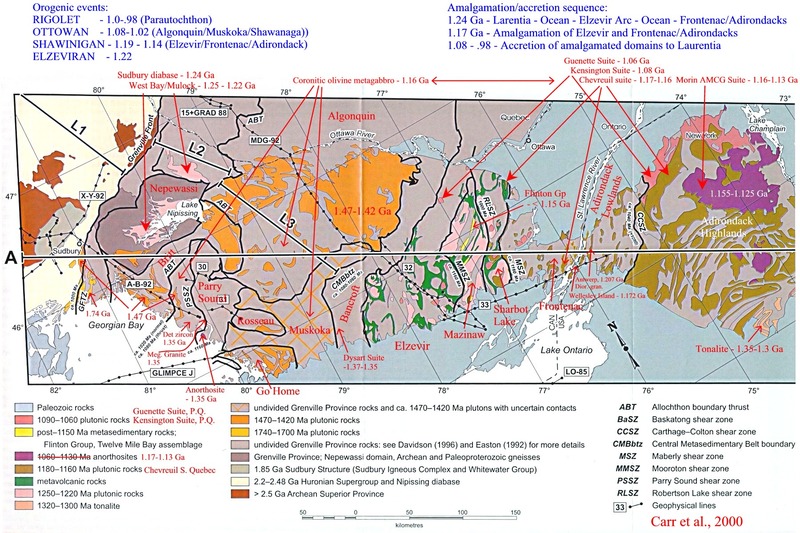 White, J.C. and Flagler, P.A., 1992 Deformation within part of a major crustal shear zone, Parry Sound Ontario: structure and kinematics: CJES, 29, 1, 129-141. Wodicka, N. and Jamieson, R.A. 1996. The Parry Sound domain: a far-travelled allochthon? New evidence form U-Pb zircon geochronology. CJES, 3, 1087-1104. Synopsis - basal Parry Sound tonalitic to granitic gneisses - 1400 - 1330; Parry Sound anorthosite - 1163+3; cross-cutting mafic dike - 1151 to 1163; interior Parry Sound assemblage tonalitic gneiss - 1314+12; detrital zircons from quartzite of the basal assemblage range from 1385 to Neoarchean, absolute maximum age of the quartzite is 1436+1. Detrital zircon from the Twelve Mile Bay assemblage sets age of deposition to 1140-1120, are from the Frontenac or Adirondacks. Parry Sound came out of CMBB thrust zone or Adirondack Highlands, emplaced relatively late by about 1080 Ma. Corfu-F; Easton-R-M, 2001 U-Pb evidence for polymetamorphic history of Huronian rocks within the Grenville Front tectonic zone east of Sudbury, Ontario, Canada. In What are we dating? Understanding the crystallogenesis of U-Pb geochronometers, Scott, David J. (editor); Moser, Desmond E. (editor) Chemical Geology. 172; 1-2, Pages 149-171. AB: This paper presents U-Pb geochronological data for zircon, titanite, monazite, apatite, allanite, and rutile from Street Township east of Sudbury that help unravel two main facets of the geology of the Grenville Front Tectonic Zone (GFTZ). They document the presence of extensive Huronian Supergroup magmatic (ca. 2480-2460 Ma) and sedimentary rocks inside the GFTZ, and highlight the significance of bimodal magmatism in the genesis of the Huronian Supergroup. The data also provide further insights into the complex orogenic evolution of the GFTZ, showing in particular that amphibolite facies metamorphism, migmatization and deformation during Grenvillian compression at 995-980 Ma overprinted, but did not totally erase, the memory of earlier metamorphic events at ca. 1720 and 1470 Ma. From the point of view of U-Pb systematics, the results emphasize the nearly ubiquitous state of isotopic disequilibrium in these rocks. Most of the minerals investigated comprise two or more generations and are generally in a state of partial resetting because of the superimposed effects of younger events. The preservation of pre-Grenvillian ages in titanite and allanite demonstrates that processes related to final Grenvillian collision and exhumation occurred at great speed. Only apatite and to some degree rutile yield ages that are clearly post-tectonic, thereby reflecting the final stages of exhumation and cooling of the region. AB: The East Greenland Caledonides occupy a crucial position in plate-tectonic reconstructions of the Late Mesoproterozoic to Early Neoproterozoic Grenville-Sveconorwegian belt. We present new field and isotopic data from the northern Stauning Alper which indicate that the 1050-930 Ma history of the area was characterized by deposition of extensive clastic sequences. Sources of detritus were dominated by rocks of Mesoproterozoic age, with only limited contributions from Archaean sources, suggesting deposition at a distance from the present Caledonian foreland. A Neoproterozoic granite (938+ or -13 Ma) provides evidence for thermal perturbation at a time of extensional collapse and uplift recorded in NW Scotland, the Grenville Belt of Canada, Labrador and the Sveconorwegian of SW Sweden and southern Norway. Widespread anatexis in the northern Stauning Alper at c. 430-425 Ma resulted from both collisional melting and decompression melting on uplift contemporaneous with the early part of orogenic collapse of the Caledonian Fold Belt. Caledonian deformation was focused at the zone of most extensive granite emplacement. Isotopic evidence suggests that Caledonian granites, previously thought to be entirely post-kinematic, actually predate late Caledonian extension. Easton-R-M 2000 Tectonic framework of the Precambrian basement of southwestern Ontario revisited. AAPG Bulletin. 84; 9, Pages 1382-1383.
and its margin, although Composite Arc Belt rocks occur to the east. The Composite Arc and Frontenac-Adirondack belts were amalgamated by approximately 1160 Ma, thrust over Laurentia during approximately 1080-1035 and approximately 1010-980 Ma convergence, and exhumed by <1040 Ma faulting. The relationship between the Midcontinent rift ( approximately 1140-1090 Ma) and Grenville orogenesis is unclear, although the rift likely established a thermal regime that influenced subsequent deformation. Penetrative deformation at approximately 1080-1035 Ma was restricted to rocks of the Laurentian margin and parts of the Composite Arc and Frontenac-Adirondack belts. Deposition of Late Neoproterozoic sediments (e.g., Lake Ontario, Ohio) may reflect Grenville exhumation. 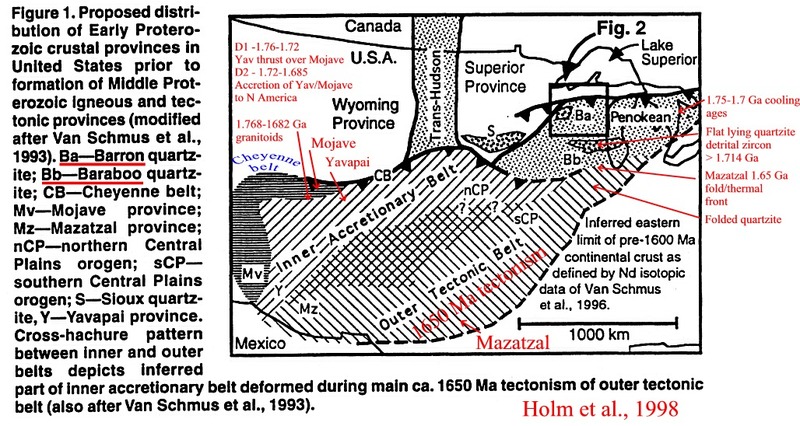 Despite a long pre-Grenvillian history, the present crustal architecture and most seismic reflectivity were acquired during 1080-980 Ma tectonism. AB: Previously, the Eastern Granite-Rhyolite Province of the eastern Midcontinent had been understood to be dominantly igneous. Work during the past 10 years has shown that much of the eastern part of the province is actually dominated by sedimentary rocks that are associated with volcanics. Age, stratigraphic, and structural relationships suggest that regionally as many as five major Mesoproterozoic and Neoproterozoic sedimentary sequences have been preserved. Four of these sequences are deposited in rift basins that appear to have been extended between major contractional episodes. The Fort Wayne Rift extensional event (1,325 to 1,284 Ma) was followed by the Elzeverian contraction ( approximately 1,240 to 1,160 Ma). The Midcontinent Rift System extensional event (1,109 to approximately 1,088 Ma) was followed by the Ottawan contraction ( approximately 1,090 to 1,025 Ma) and thrusting in that system. The East Continent Rift Basin extensional event (1,020 to approximately 950 Ma) was followed by the Grenville Front contraction ( approximately 950 to 890 Ma) and folding and faulting in the associated rocks. The last extensional event of the Proterozoic ( approximately 700 to 600 Ma) was followed by the Louisville contraction (600 Ma). The Louisvillle contractional event resulted in thrusting and inversion of the Louisville Block and about 8 km of overburden being removed. West of the Louisville Block during late Mesoproterozoic, foreland basin rocks were deposited in the English Basin and subsequently eroded by a regional unconformity. Boerner-David-E; Milkereit-Bernd; Davidson-A 2000 Geoscience impact; a synthesis of studies of the Sudbury Structure. Canadian Journal of Earth Sciences,. 37; 2-3, Pages 477-501.
impact-induced deformation. Geophysical views of the Sudbury Igneous Complex are thus somewhat biased in representing mostly the post-impact, but pre-Grenvillian history of the region, with the exception of igneous events. Establishing the proper context for integrating these geophysical results in the genetic interpretation of the Sudbury Structure depends crucially upon timing constraints. Rivers-Toby; Corrigan-David 2000. Convergent margin on southeastern Laurentia during the Mesoproterozoic; tectonic implications. Canadian Journal of Earth Sciences, 37; 2-3, Pages 359-383. AB: A continental-margin magmatic arc is inferred to have existed on the southeastern (present coordinates) margin of Laurentia from Labrador to Texas from approximately 1500-1230 Ma, with part of the arc subsequently being incorporated into the 1190-990 Ma collisional Grenville Orogen. Outside the Grenville Province, where the arc is known as the Granite-Rhyolite Belt, it is undeformed, whereas within the Grenville Province it is deformed and metamorphosed. The arc comprises two igneous suites, an inboard, principally quartz monzonitic to granodioritic suite, and an outboard tonalitic to granodioritic suite. The quartz monzonite-granodiorite suite was largely derived from continental crust, whereas the tonalitic-granodiorite suite is calc-alkaline and has a juvenile isotopic signature. Available evidence from the Grenville Province suggests that the arc oscillated between extensional and compressional settings several times during the Mesoproterozoic. Back-arc deposits of several ages, that formed during relatively brief periods of extension, include (1) mafic dyke swarms subparallel to the arc; (2) continental sediments, bimodal volcanics and plateau basalts; (3) marine sediments and volcanics formed on stretched continental crust; and (4) ocean crust in a marginal basin. Closure of the back-arc basins occurred during the accretionary Pinwarian ( approximately 1495-1445 Ma) and Elzevirian ( approximately 1250-1190 Ma) orogenies, as well as during three pulses of crustal shortening associated with the 1190-990 Ma collisional Grenvillian Orogeny. During the Elzevirian Orogeny, closure of the Central Metasedimentary Belt marginal basin in the southeastern Grenville Province was marked by subduction-related magmatism as well as by imbrication of back-arc deposits. The presence of a continental-margin magmatic arc on southeastern Laurentia during the Mesoproterozoic implies that other coeval magmatism inboard from the arc took place in a back-arc setting. Such magmatism was wide-spread and chemically diverse and included large volume "anorogenic" anorthosite-mangerite-charnockite-granite (AMCG) complexes as well as small volume alkaline, quartz-saturated and -undersaturated "within-plate" granitoids. Recognition of the approximately 300 million year duration of the Mesoproterozoic convergent margin of southeastern Laurentia suggests that there may be useful parallels with the evolution of the Andes, which has been a convergent margin since the early Paleozoic. Hynes-Andrew; Indares-Aphrodite; Rivers-Toby; Gobeil-Andre 2000. Lithoprobe Line 55; integration of out-of-plane seismic results with surface structure, metamorphism, and geochronology, and the tectonic evolution of the eastern Grenville Province. Canadian Journal of Earth Sciences, 37; 2-3, Pages 341-358. AB: Lithoprobe line 55, in the Grenville Province of eastern Quebec, provides unusually good control on the three-dimensional (3-D) geometry and structural relationships among the major lithological units there. Archean basement underlies the exposed Proterozoic rocks, along the entire seismic line, and there is a lateral ramp in this basement immediately behind a lobate stack of thrust slices of high-pressure metamorphic rocks comprising the Manicouagan Imbricate Zone (MIZ). Integration of the 3-D geometry with P-T and geochronological data allows derivation of a tectonic model for the region. The MIZ was buried to depths >60 km at 1050 Ma. Preservation of its high-pressure assemblages, and the absence of metamorphism at 990 Ma, which is characteristic of lower pressure metamorphic rocks that tectonically overlie them, indicates the MIZ rocks were rapidly unroofed, early in the tectonic history. There were two discrete pulses of crustal thickening during the Grenvillian Orogeny in this region. The first, involving imbrication of Labradorian and Pinwarian rocks that comprised part of southeast Laurentia, culminated in the Ottawan pulse at ca. 1050 Ma, and produced the high-pressure metamorphism of the MIZ. Its effects were rapidly reversed, with extrusion of the MIZ rocks to shallow crustal levels at ca. 1020 Ma. The crust was again thickened, with the Moho subsiding to depths >60 km, in the Rigolet pulse at ca. 990 Ma. The site of extrusion of the MIZ was probably controlled by the subsurface lateral ramp. High geothermal gradients indicate that extrusion may have been aided by lithospheric delamination in the crustal-thickening zone. 1.17-1.16 Ga Chevreuil Intrusive Suite and host gneisses, Quebec. Canadian Journal of Earth Sciences, 37; 2-3, Pages 253-269.
pressure-temperature (P-T) metamorphic event. The sheet intrusions define magmatic corridors all along, and concordant with, the western, northern, and eastern tectonic boundaries of the belt. The concordant and elongate shape of these bodies results from emplacement, not deformation. Chevreuil magmas thus sealed the belt boundaries largely in their current positions, with the implication that docking of Elzevirian and pre-Elzevirian terranes with cratonal North America predates 1.17 Ga. We interpret the 1.20 Ga metamorphism as evidence for the initiation of Grenvillian continent-continent collision during the culmination of the Elzevirian orogeny at ca. 1.22 Ga. Emplacement-related fabrics indicate that the Chevreuil suite and the coeval Morin anorthosite suite intruded during renewed orogenesis. This orogenic pulse (Shawinigan) is not accretionary, but represents a strongly partitioned, compressive, intraplate reactivation event. magma emplacement, and Lithoprobe reflectors. Canadian Journal of Earth Sciences, 37; 2-3, Pages 235-251. Ketchum-J-W-F; Davidson-A 2000. Crustal architecture and tectonic assembly of the Central Gneiss Belt, southwestern Grenville Province, Canada; a new interpretation. Canadian Journal of Earth Sciences, 37; 2-3, Pages 217-234. AB: The Central Gneiss Belt, southwestern Grenville Province, is characterized by parautochthonous crust in the north and allochthonous lithotectonic domains in the south. Despite nearly two decades of study, the basal decollement to allochthonous domains transported from the southeast, known as the allochthon boundary thrust, has not been precisely located throughout much of the belt. Between Lake Nipissing and Georgian Bay where its surface trace is known, it separates 1.24 Ga Sudbury metadiabase in the footwall from eclogite remnants and 1.17-1.15 Ga coronitic olivine metagabbro confined to its hanging wall. On the premise that this relationship can be used to trace the allochthon boundary thrust elsewhere in the Central Gneiss Belt, we have sought to extend the known distribution of these mafic rock types, making use of field, petrographic, and geochemical criteria to identify them. New occurrences of all three mafic types are identified in a region extending from south of Lake Nipissing to western Quebec, and the mutually exclusive pattern of occurrence is maintained within this region. Structural trends and reconnaissance mapping of high-strain zones that appear to represent a structural barrier to the mafic suites suggest that the allochthon boundary thrust lies well to the north of its previously suggested location. Our preferred surface trace for it passes around the southern end of the Powassan batholith and through the town of North Bay before turning east to join up with the Lac Watson shear zone in western Quebec. This suggests that a large segment of "parautochthonous" crust lying north of, and including, the Algonquin domain is in fact allochthonous. The mutually exclusive distribution of the mafic suites points to significant separation of allochthonous and parautochthonous components prior to the Grenvillian orogeny, in accord with models of pre-Grenvillian continental rifting proposed by others. Despite a relative abundance of geological and geochronological data for the Central Gneiss Belt and a mafic rock distribution that appears to successfully locate a major tectonic boundary, we emphasize the need for additional field and laboratory work aimed at testing our structural model. Carr-S-D; Easton-R-M; Jamieson-R-A; Culshaw-N-G 2000. 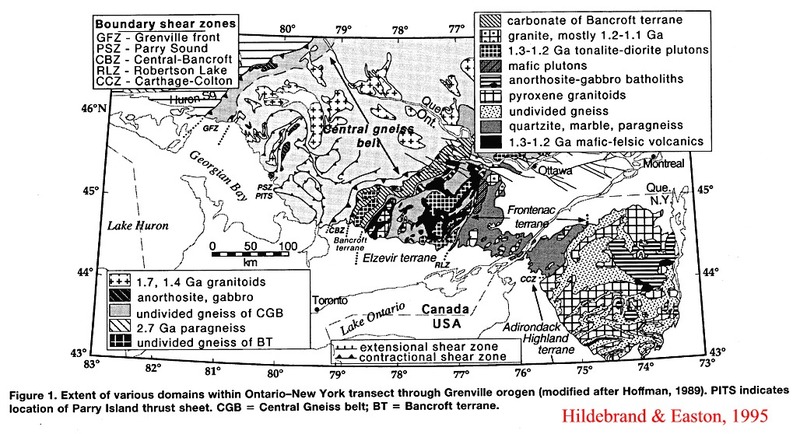 Geologic transect across the Grenville Orogen of Ontario and New York.Canadian Journal of Earth Sciences, 37; 2-3, Pages 193-216. AB: Revised cross sections of the western Grenville Province incorporate new geologic results and reprocessed seismic reflection data. 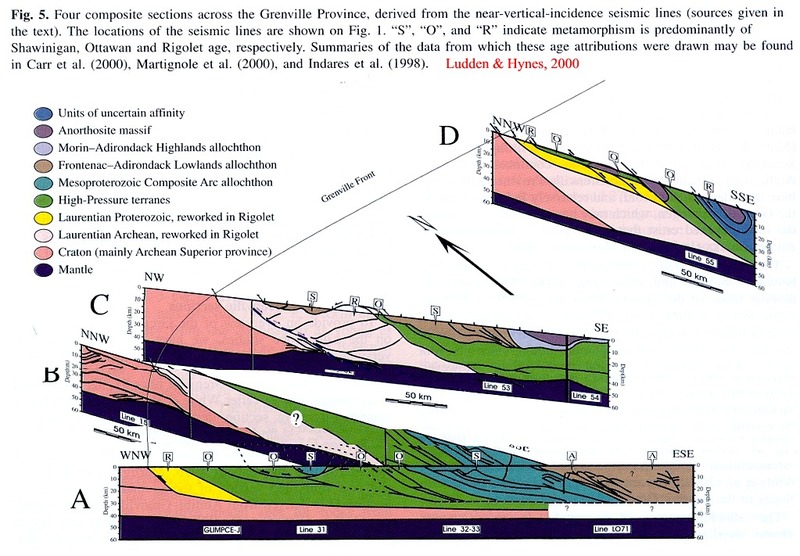 The geology is presented in terms of three tectonic elements: (1) "pre-Grenvillian Laurentia and its margin" with ca. 1740 and 1450 Ma continental arc plutons and associated supracrustal rocks; (2) "Composite Arc Belt" of allochthonous approximately 1300-1250 Ma volcanic arcs and sedimentary rocks; and (3) "Frontenac-Adirondack Belt" characterized by supracrustal and granitoid rocks, and anorthosites, of uncertain affinity, that may represent a distinctive part of the Composite Arc Belt or an offshore (micro) continent. 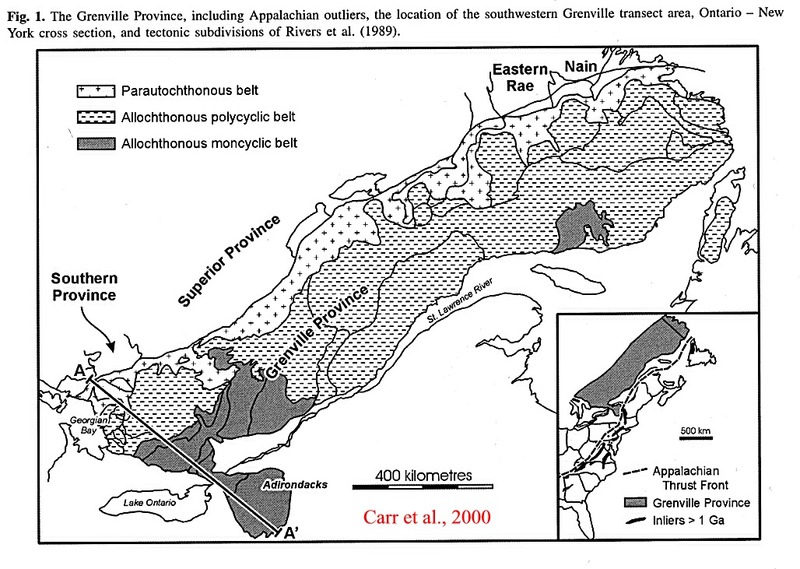 Rocks of the Composite Arc and Frontenac-Adirondack belts were amalgamated with each other by ca. 1160 Ma, were then thrust over Laurentia during ca. 1080-1035 Ma and ca. 1010-980 Ma phases of convergence, and were dissected and exhumed by <1040 Ma normal faults. Penetrative deformation was restricted to that part of the pre-Grenvillian Laurentian margin that lies to the southeast of the Grenville front and parts of the accreted Composite Arc and Frontenac-Adirondack belts. The Laurentian rocks in the Grenville Province are bounded to the northwest and southeast by southeast-dipping ductile thrust and (or) normal shear zones. The Composite Arc and Frontenac-Adirondack belts to the southeast are bounded by ductile and brittle-ductile thrust and (or) normal faults that separate domains with contrasting cooling histories. Despite a long pre-Grenvillian tectonic and plutonic history, the present crustal architecture and much of the seismic reflectivity were acquired during 1080-980 Ma phases of compression and extension. White-Donald-J; Forsyth-D-A; Asudeh-I; Carr-S-D; Wu-H; Easton-R-M; Mereu-R F 2000. 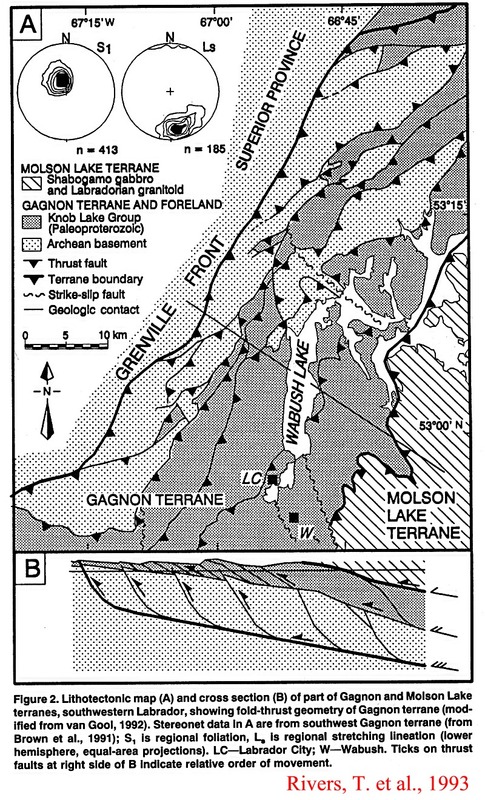 A seismic-based cross-section of the Grenville Orogen in southern Ontario and western Quebec. Canadian Journal of Earth Sciences, 37; 2-3, Pages 183-192. AB: A schematic crustal cross-section is presented for the southwestern Grenville Province based on reprocessed Lithoprobe near-vertical incidence seismic reflection data and compiled seismic refraction - wide-angle velocity models interpreted with geological constraints. The schematic crustal architecture of the southwest Grenville Province from southeast to northwest comprises allochthonous crustal elements (Frontenac-Adirondack Belt and Composite Arc Belt) that were assembled prior to ca. 1160 Ma, and then deformed and transported northwest over reworked rocks of pre-Grenvillian Laurentia and the Laurentian margin primarily between 1120 and 980 Ma. Reworked pre-Grenvillian Laurentia and Laurentian margin rocks are interpreted to extend at least 350 km southeast of the Grenville Front beneath all of the Composite Arc Belt. Three major structural boundary zones (the Grenville Front and adjacent Grenville Front Tectonic Zone, the Central Metasedimentary Belt boundary thrust zone, and the Elzevir-Frontenac boundary zone) have been identified across the region of the cross-section based on their prominent geophysical signatures comprising broad zones of southeast-dipping reflections and shallowing of mid-crustal velocity contours by 12-15 km. The structural boundary zones accommodated southeast over northwest crustal stacking at successively earlier times during orogeny (ca. 1010-980 Ma, 1080-1060 Ma, and 1170-1160 Ma, respectively). These shear zones root within an interpreted gently southeast-dipping regional decollement at a depth of 25-30 km corresponding to the top of a high-velocity lower crustal layer. 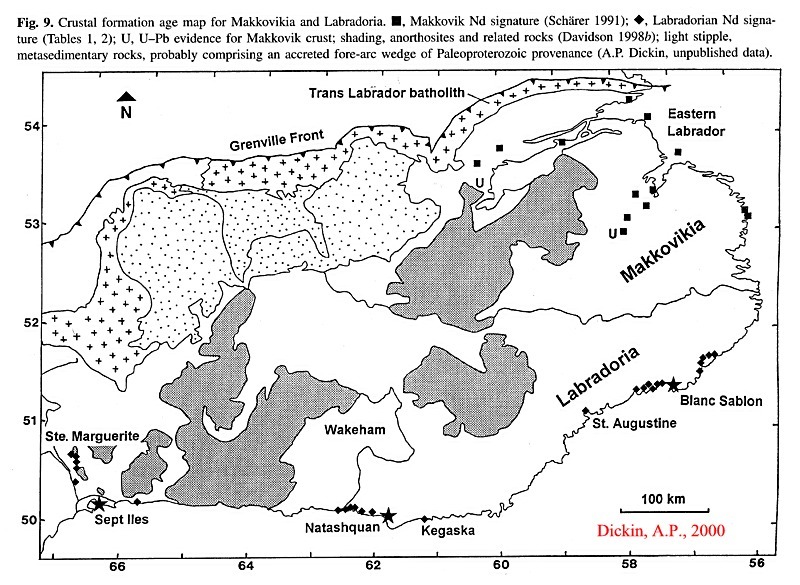 Dickin-A-P 2000 Crustal formation in the Grenville Province; Nd-isotope evidence. Canadian Journal of Earth Sciences, 37; 2-3, Pages 165-181. AB: Ninety-eight new Nd-isotope analyses are presented for gneissic rocks from the Grenville Province. When combined with over 250 published Nd analyses and some unpublished analyses, these data can be used to establish a first-order crustal formation age map for most of the Grenville parautochthon and allochthonous polycyclic belt. In particular, the geographic extents of a juvenile Labradorian arc (Labradoria) and a juvenile 1.5 Ga arc (Quebecia) are defined, each with an area probably in excess of 100 000 km (super 2) . 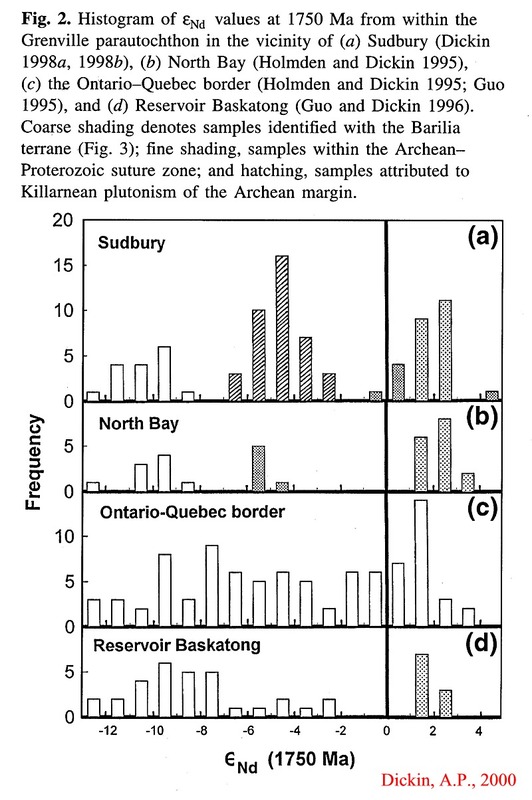 In addition, pre-1.75 Ga arcs are identified in Ontario (Barilia) and Labrador (Makkovikia). This work largely fills the last major gap in the continent-wide crustal formation age map of the Precambrian Shield of North America. Peck, William H; King, Elizabeth M., Valley, John W. 2000. Oxygen isotope perspective on Precambrian crustal growth and maturation. Bull. Geological Society of America. 28, 4, Pages 363-366. AB: In this study we contrast insights on Precambrian crustal growth and maturation from radiogenic and oxygen isotope systematics in the Superior (3.0-2.7 Ga) and Grenville (1.3-1.0 Ga) provinces of the Canadian Shield. Oxygen isotope ratios in zircon provide the best evidence of supracrustal input into ancient orogens. Archean Superior Province zircons have relatively low delta 18O values and a limited range (5.7% +/- 0.6%), while Proterozoic Grenville Province zircons have elevated delta 18O values and a wider range (8.2% +/- 1.7%). 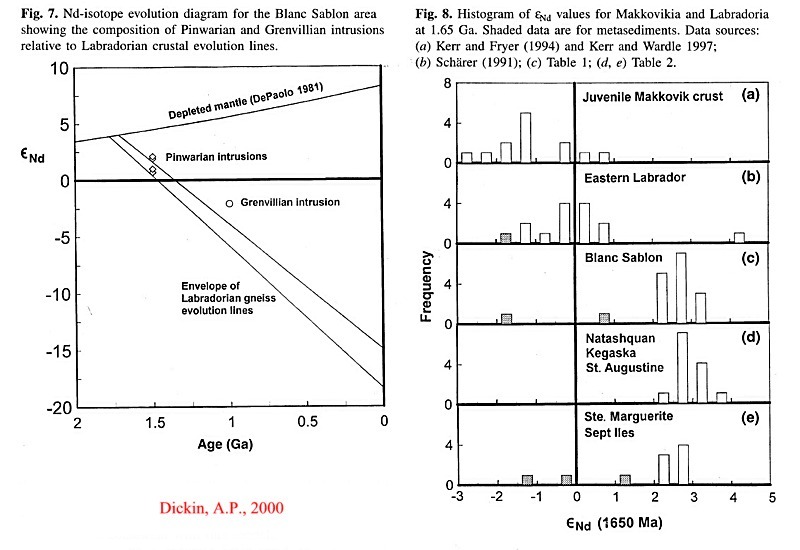 These data reflect fundamental differences in crustal evolution and maturation between the Superior and the Grenville provinces. In the Grenville Province, radiogenically juvenile supracrustal material with high delta 18O values was buried (or subducted) to the base of the crust within 150 m.y. of initial crust production, causing high magmatic delta 18O values (delta 18O [zircon] > or = 8%) in anorthosite suite and subsequent plutons. Information about large volumes and rapid recycling of Grenville crust is not accessible from radiogenic isotope data alone. The Grenville data contrast with the restricted delta 18O values of Superior Province magmatism, where subtle ( approximately 1%) elevation in delta 18O occurs only in volumetrically minor, late to postorogenic (sanukitoid) plutons. Differences in sediment delta 18O values between the Superior and Grenville provinces are predominantly a function of the delta 18O of source materials, rather than differences in chemical maturity or erosion styles. This study shows that zircon is a robust reference mineral to compare igneous processes in rocks that have undergone radically different histories.